In case you haven't heard it's Breast Cancer Awareness Month. Roughly 1 in 8 women in the U.S. will develop breast cancer over the course of her lifetime. Organizations like Bright Pink aim to change that through education and awareness programs for high-risk individuals, which I happen to be one of. My Father's Mother Eve lost her battle with Ovarian Cancer in the 60's before I was even a glimmer in my parent's eyes, and my Aunt Lexi died of Breast Cancer in the early 90s at the age of 40. So to raise awareness and support for the cause we teamed up with Topshop stylist extraordinaire Mellissa Muoio who created three very pink head-to-toe Topshop looks for us to capture. 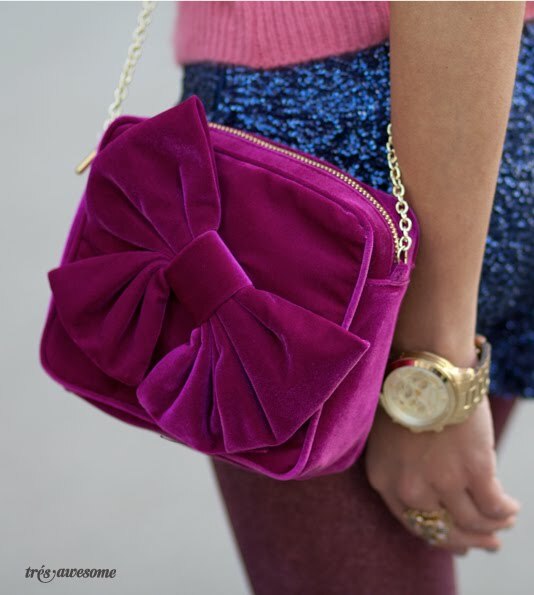 This is such a good idea, and I LOVE that purse.